This is either RAC Platinum Cover, the Balance of the Manufacturer's Warranty or a combination of both. 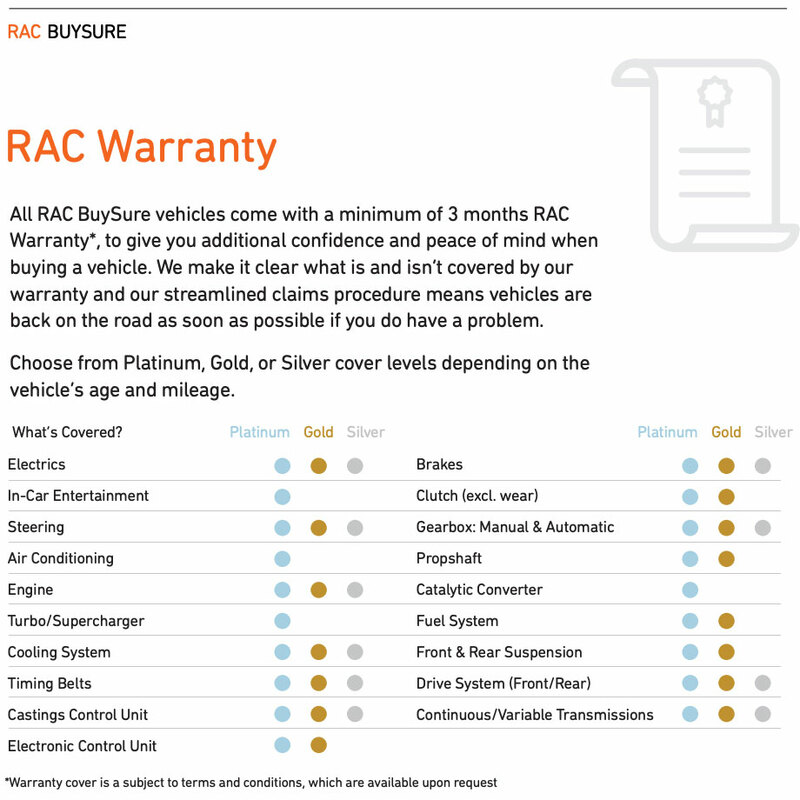 Because the vast majority of vehicles we sell have a full service history they will come with the balance of the manufacturer's warranty; this will be topped up to 3-years with the RAC cover. For instance, if a vehicle is 2-years old you will receive 1-year manufacturer warranty with 2-year RAC cover starting from its 3rd birthday. * Exclusions apply. Please ask for details if you are purchasing for Hire & Reward or if the vehicle is over 3.5t gross weight. This is the same warranty you would get if you purchased a vehicle new or used from a franchise dealer. In the event of any issues simply contact your local franchise dealer to get it booked in. Once the manufacturer's warranty expires the RAC warranty will commence. We are an RAC Approved Dealer so all of our vehicles come with RAC BuySure; a guarantee that every vehicle has been prepared to the RAC 82 Point Approved Vehicle Standard and come with 12-months complimentary breakdown cover and a minimum of three months Warranty from the RAC as standard.